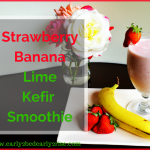 School’s out, the pool’s open, and you have this delectable Strawberry Banana Lime Kefir smoothie recipe in your hand… summer has arrived, and so has your daily energy and nutrient boost! This is my new summer drink! It’s amazing flavor and even more amazing health benefits will quickly make it your summer drink of choice, too. 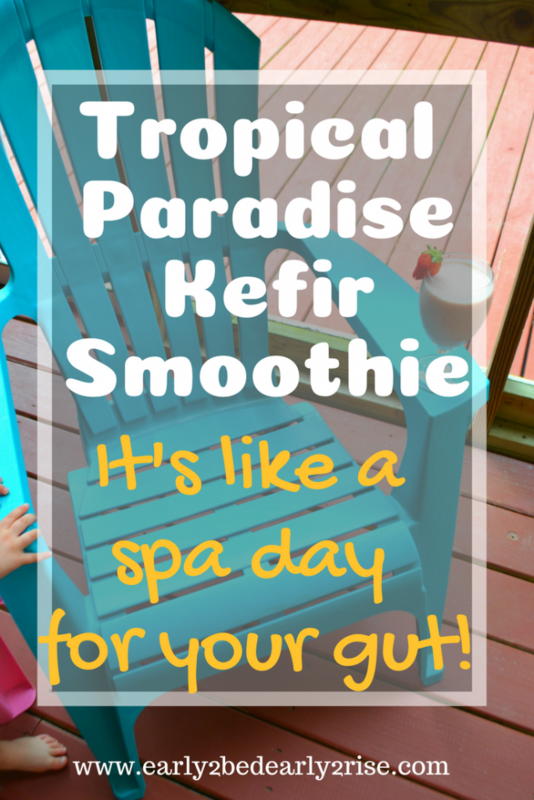 Bursting with nutrients to nourish your gut and fabulous, fresh flavors, you’ll feel like you’re on a tropical island spa retreat with every sip. For my Trim Healthy Mama friends, this is a fabulous E choice for you filled with lots of protein, naturally low in fat, and packed with healthy carbohydrates. 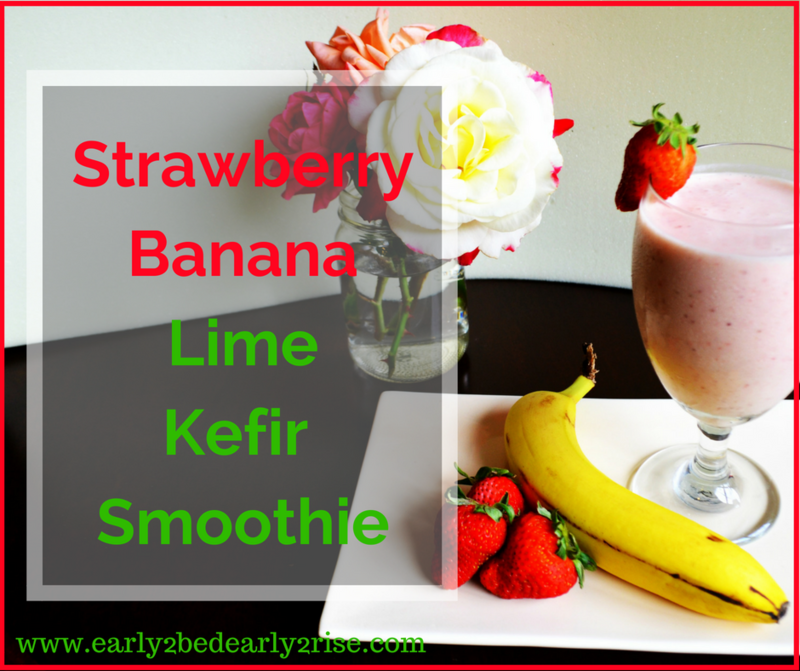 If you struggle with E’s, jump on the kefir train and let this delicious smoothie win you over! New to THM? Here’s more details and my story of losing all the baby weight in just 4 months! 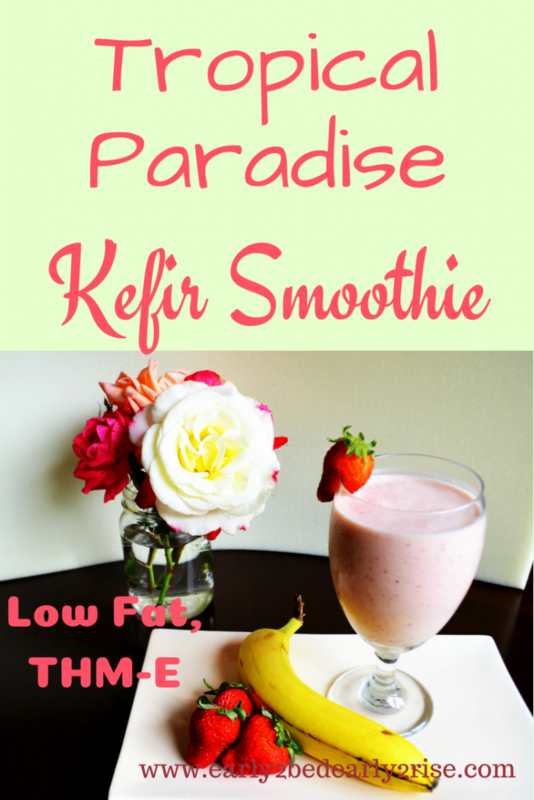 Kefir is a cultured beverage teeming with probiotics. Pretty much, it’s like a drinkable yogurt that’s been cultured in such a way that the majority of the lactose is gone (it’s usually like 99% lactose free). Probiotics offer amazing health benefits for more than just your tum. While they definitely do promote good intestinal health by introducing healthy gut bacteria, they also do so much more! Approximately 80% of your immune system starts in your gut. Good gut health gives you the building blocks to create healthy immune function. The majority of your neurotransmitters also start in your gut, so you can kinda consider kefir as an all natural Prozac. 😉 Kefir can equip your body to make the neurotransmitters that help you feel happier. How amazing is that?! It’s literally a feel-good food! Typically, I recommend taking any probiotic rich foods or supplements at bedtime since they implant better while you’re resting. However, because of the baobab powder in this recipe and it’s amazing ability to boost energy levels, I def do NOT advise you to drink this before bed! Keep it in your stash of afternoon pick-me-up recipes section! You can buy kefir at the store, but bonus points to you if you want to make it at home! 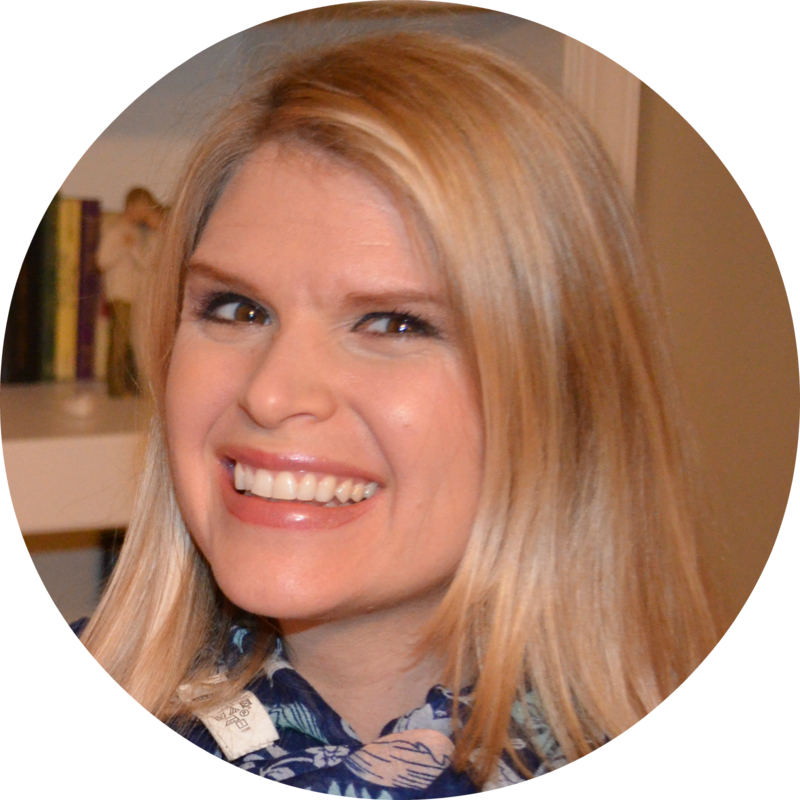 My blog buddy Stacey has a great post about how to make your own! In the THM world, it’s usually advised to double ferment your kefir… this process allows the good bacteria to grow and increase tremendously, giving you even more of its amazing health benefits. It also reduces the carb count, resulting in a fuel pull version of kefir. Kefir that you buy in the store has typically only undergone a single ferment and is usually considered an E, or energizing, fuel. Because double fermented kefir has got more goodies in it, the trade off is an increase in the tanginess (ie, sourness) of the kefir. You might need to increase the amount of sweetener used until it’s just the right combo to make your taste buds sing. You need baobab in your life. Seriously, this stuff is amazing! Move over, acai! It’s packed with vitamin C and iron, which is a fabulous combination! Iron is better absorbed by the body when accompanied by vitamin C, so God created this awesome superfood that has both already in it… and it tastes way better than liver, another food high in iron! Baobab is also great for immune health thanks to all the antioxidants packed into it. We took it during flu season this year and avoided that and many other colds! Baobab may also reduce the risk of developing cancer, and it may help to maintain a healthy blood pressure. It’s also full of fiber, so please keep that in mind if you’re new to this superfood. You might want to start low and go slow… increase your dose slowly over a few days or you might end up spending some quality time in the loo (hint hint wink wink). My favorite health benefit of baobab is the amazing energy boost it gives me!! While it contains no caffeine, it’s an excellent mid morning or afternoon pick-me-up. This is most likely due to the fact that it’s a powerhouse of B vitamins (B’s work better together– they are better absorbed when you take them as a family than as isolated pills). As a note of caution, I don’t recommend taking baobab too close to bedtime. For me, I need to finish it before 4 or 5pm so that I can fall asleep okay (lol, we got to bed early at 9:30, so adjust accordingly for your own schedule). Oh, collagen, how I love thee! Thou hast given me long nails, long hair, and a healthy gut! Pretty sure that I should rename this smoothie The Good Gut smoothie. Collagen is fantastic for promoting small intestine health. It can help to heal up intestinal dysbiosis (aka Leaky Gut Syndrome), which can lead to food sensitivities. Collagen comes from gelatin, and it’s one of the most potent parts. It is full of protein, and it can help to grow strong and shiny hair and nails. It can also help to alleviate arthritis symptoms as it helps to support healthy joints. It’s a fantastic post workout recovery protein that’s easily absorbed and helps to soften the impact of strenuous exercise on joints. The Trim Healthy Mama collagen is my personal favorite. It dissolves easily into drinks and oatmeal without leaving a gross taste. When I’m not using it in this smoothie, I also add it to my morning coffee (doesn’t change the flavor, makes it more creamy, and helps my hair grow like crazy). 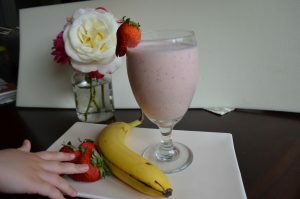 This sweet lil smoothie will be your summer go to for a tasty treat that packs a big nutritional punch! I usually use this Baobab Powder in my smoothies. I can usually find this brand at my local Walmart, but I’ve also found it on Amazon, too, for the same price! 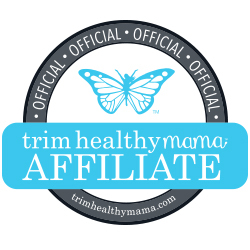 I’ve heard amazing things about the Trim Healthy Mama brand of Baobab. It’s next on my list of things to try this summer! It’s a pretty potent brand of Baobab, so you can use half as much as the brand listed above. The Baobab and Collagen are both optional in this smoothie, but I would definitely recommend both! They make amazing, healthy additions!! It's a tropical island getaway for your tastebuds and a healthy spa weekend for the rest of you! I use 2 tsps of the BetterBody Brand of Baobab; you will probably get the same results with 1 tsp of the THM brand. I've listed stevia as the sweetener; you can change it up with your own favorite and sweeten to taste. Pin this recipe for later by clicking on the image below! Loved , it is my style of living and eating! !